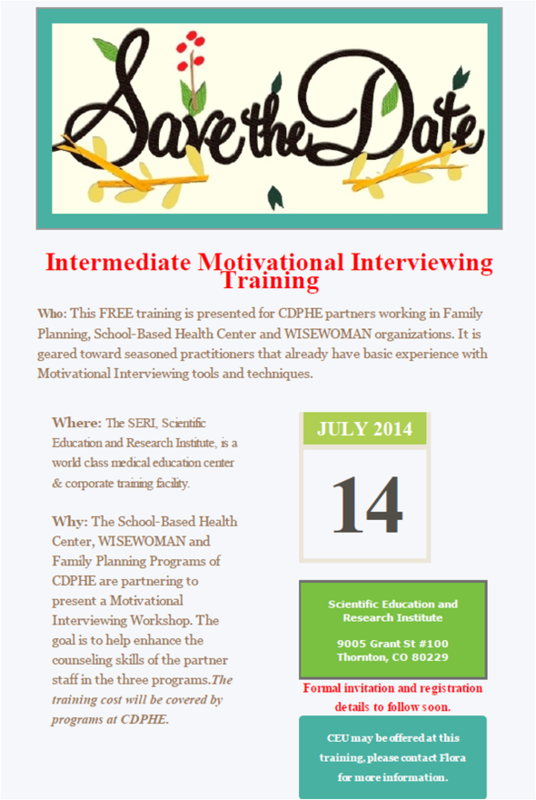 July 1 is the final day to register for this free, Intermediate Motivational Interviewing workshop. Don't miss this exciting opportunity to refresh and enhance your motivational interviewing skill set. All health care professionals who work directly with patients will benefit from this training. Who: This FREE training is presented for CDPHE partners working in Family Planning, School-Based Health Center and WISEWOMAN organizations. It is geared toward seasoned practitioners that already have basic experience with Motivational Interviewing tools and techniques. Where: The SERI, Scientific Education and Research Institute. Why: The goal of this workshop is to help enhance the counseling skills of partner staff. The training cost will be covered by programs at CDPHE. Seats are filling quickly; reserve yours now! Click on the link to register: Register now!